It's been a long time since I've posted on here. I've taken quite a few months to really think about what I'd like to share with the world and what I want my blog to be. Dozens of blogs, Twitter, Instagram and Pinterest have overloaded my senses and left me jaded. Now, I hope to return to the basics, focus on what I love in hopes that you'll love it, too, and start fresh. 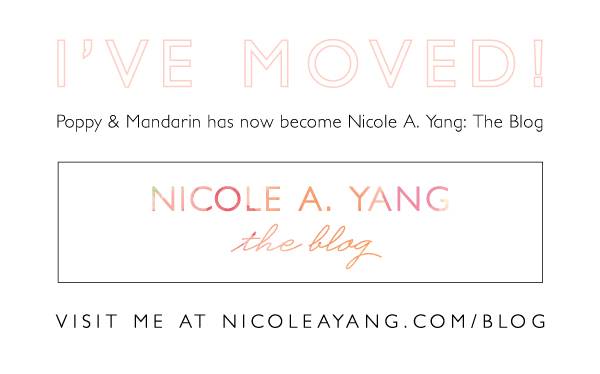 I'm moving my blog to a new site and testing the waters with this new outlook in mind. Please join me! Click here to take a look around my new space. Sometimes you get a client that wants everything you want -- and that is a wonderful blessing. 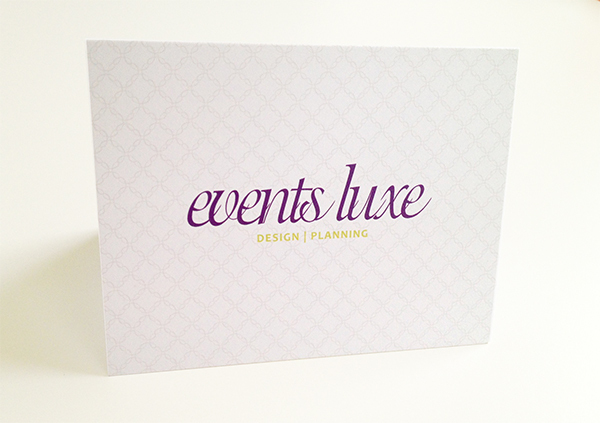 I had so much fun working with the ladies of Events Luxe in St. Louis on their new business cards and note cards. Their name says it all: they're an event planning company that creates gorgeous high end productions, highly detailed and bursting with customized concepts. I LOVE that their new business cards reflect just that. I worked with Mama's Sauce to make these cards and so enjoyed the process. They're one of the nicest printers I've ever worked with and were always on the phone discussing nerdy printing specs and paper textures with me (so of course I love them). We added in some bright chartreuse edge painting for a fun pop of modern color on their otherwise simplistic business card. A blind letterpress pattern on the front gives them a luxurious texture without the visual clutter. Their "el" logo on the back, which was originally conceptualized as blind letterpress, gets a little glam with some ivory foil. I had never seen ivory foil before, but it's gorgeous! It's got a wonderful sheen without the metallic of silver, and gives more depth to the card than a matte white foil or clear gloss would. Some luxe business cards were paired with digitally printed A2 folded note cards that the ladies are packaging with gorgeous plum envelopes. It's fall! I actually totally forgot that fall was officially coming this weekend. Probably because for the past few weeks, I've been obsessed with the fact that it was still hot gross summer. I love their fall collection -- it's a little bit equestrian and a little masculine. Dark and fall-inspired is just what I'm craving. How amazing is this outfit? A few of my other favorite items from their fall collection include the Chelsea top, the adorable giraffe key fob, their striped chambray scarf (Ah! I must have it!) and the Vintage Revival Satchel in rust. I feel a bit jaded by the blog world lately. Sometimes I love how easy it is to find inspiration and ideas everywhere. Nowadays, however, I'm craving a style and an approach that's all my own and I find that I'm way too influenced by the things that I see and hear instead of the things that I imagine. I've started thinking about grown-up things like where I see myself in one year, three years, five years, what my career goals are and which days are best to go to the grocery store. Taking time away from Google Reader has helped me hone in on that a bit -- the things I really want instead of the things I think I'm supposed to want. Another great step? I finished up some collateral design work (new business cards and note cards) for a client recently and received their prints in the mail. It's so rejuvenating to see the tangible products of my work, to feel good about what I've done and excited to share the end product. I wrapped it up nicely with some tissue paper and bias cut fabric ribbon, then stuck my new note cards and business cards in there. It feels good to send it away. I was avoiding Old Navy for a few years. When you're 10, that's totally the place to shop (and mostly because that's just where Mom took you). When you're 14, you feel like wearing hot pink punky statement pieces and wish you were cool enough to even step inside a Hot Topic (or you were a Hollister frequenter, strong enough to withstand the smack of colognes and perfumes that permeated any 20 foot radius of the place and had the magical power of spotting exactly what you wanted even though the store was dark enough for a vampire to live in). But now, Old Navy is turning around. I went into an Old Navy the other day that had candy at the checkout line. And space ice cream! And books! And Cliff bars! And my size in everything! Way cool. It was at this and I found my new all time favorite pants. 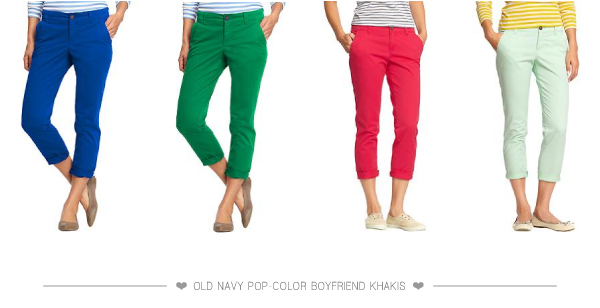 I know I said in this post that I'd be wearing Gap pants all the time, but it didn't work out. I brought them home and they fit awkwardly. You know, with that weird pulling around the hips. No good. Old Navy's where it's at. For now.